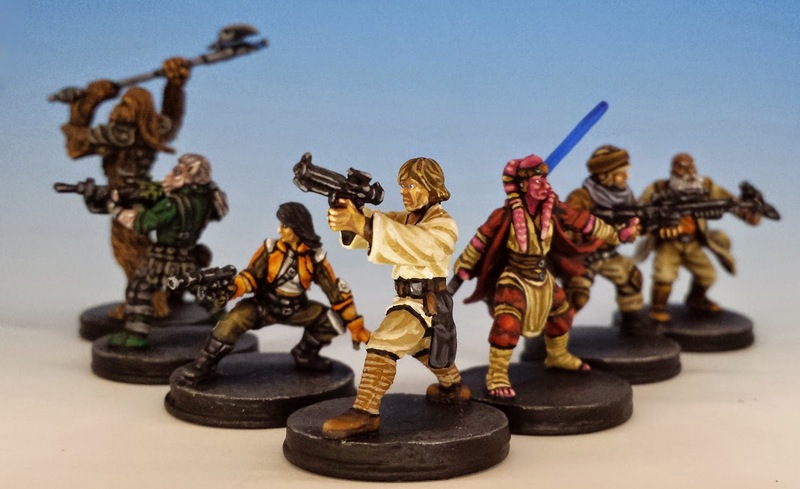 Behold the heroes of the Rebel Alliance from the new Star Wars miniature game, Imperial Assault. To celebrate finishing all these, I just watched the original Star Wars trilogy. And not just any version, but the recently released guerrilla edition called "Harmy's Star Wars Despecialized" - a painstaking reconstruction of the movies (in HD) as they first appeared in the cinemas. Watching A New Hope for the first time in years, I discovered a riddle that I had never noticed before. The riddle is: why did Obi-Wan Kenobi wait? The scene is the Death Star, as Ben Kenobi and Darth Vader meet for the trilogy's first lightsaber battle. I have always remembered Ben's last words before his death: "You can't win, Darth. If you strike me down, I shall become more powerful than you can possibly imagine." He raises his lightsaber as if in salute and allows Vader to strike him... but of course, he has disappeared and his empty robe falls to the ground. For me, it's the best moment in the whole series. As viewers, we get the feeling that this was Ben's plan all along. And indeed, Darth Vader himself foreshadowed the event when he first goes to fight Ben. Grand Moff Tarkin told Vader that Ben "must not be allowed to escape," to which Vader replied, "Escape is not his plan. I must face him alone." Perhaps Vader thought Ben had come to kill him, a blinkered view consistent with his enslavement to the Dark Side. Ben, on the other hand, seems to understand that it is only by confronting Vader that he can attain the next stage in his being, just as Luke must confront Vader (in Return of the Jedi) before finally becoming a Jedi Knight. But the riddle is this: Ben could have allowed himself to be "taken" by Vader at any time. But he waited. He waited until he knew Luke was watching. Only then does he lower his guard. Why? Ben sees the troops charging toward him and realizes that he is trapped. Vader takes advantage of Ben's momentary distraction and brings his mighty lightsaber down on the old man. Ben manages to deflect the blow and swiftly turns around. The old Jedi Knight looks over his shoulder at Luke, lifts his sword from Vader's then watches his opponent with a serene look on his face. The script makes it sound like Ben's surrender comes from his being trapped and distracted. But in the movie, there are no charging troops. Nor is Vader beating him. Instead, Ben takes a long look at Luke, and then turns to Darth and smiles. The enigmatic expression on Alec Guiness' face suggests that Ben has waited years for this moment to arrive. In order to come to an answer, I think it is important to understand what lightsaber battles mean in the original trilogy. There are only three of them (not counting Luke's short duel with the phantom on Dagobah) and one important fact stands out in all of them: no one ever truly dies in a lightsaber duel. This is because these duels are not about who is the better swordsman or even who is stronger in the Force. Death is beside point. Darth Vader is never trying to kill Luke; he is trying to corrupt him. What gives these battles dramatic tension is that we feel that Luke can't win. Either he fights back against Vader, releasing his anger and succumbing to the Dark Side. Or he extinguishes his lightsaber and lets Vader (or the Emperor) triumph unopposed. The genius of Lucas is to put Luke and the audience in the same place, asking the same question: what is the solution? I think this is where Ben comes back into the picture. I believe Ben waited for Luke because he wanted to show him how to win a lightsaber duel. A Jedi wins by letting go. In The Empire Strikes Back and Return of the Jedi, we see how this lesson plays out. In Empire, at the conclusion of his battle with Vader, Luke literally lets go, allowing himself to plunge off of the gantry on Bespin and free-falling into space. It's a desperate act without self-assurance or self-knowledge. Although this can't exactly be described as a victory, it does prevent Luke from joining his father on the Dark Side. In Return of the Jedi, Luke achieves enough understanding to let go of his anger once and for all (symbolized by him discarding his lightsaber as he stands over Vader). At first this seems like a kind of capitulation to the Emperor, who is free to attack Luke without opposition. But like Ben's self-sacrifice on the first Death Star, Luke's act of self-liberation on the second Death Star has a spectator; Darth Vader learns from Luke that letting go is possible, just as Luke learned it from Ben. In sum, there are three things you can say about lightsaber battles in the original trilogy: First, they are an inner struggle not a battle to the death. Second, the path to victory is a mystery, for both the Jedi and the audience. Third, a true Jedi is always teaching. Sadly, such fascinating ideas were entirely lost in prequels, where Jedi duels are reduced to nothing more than acrobatics. As Count Dooku says to Yoda in Attack of the Clones, "It is obvious that this contest cannot be decided by our knowledge of the Force, but by our skills with the lightsaber." *** UPDATE - I've changed the title of this post from "Heroes of the Rebel Alliance" to "The Lightsaber's Riddle". I woke up this morning and it just seemed like a more descriptive name. 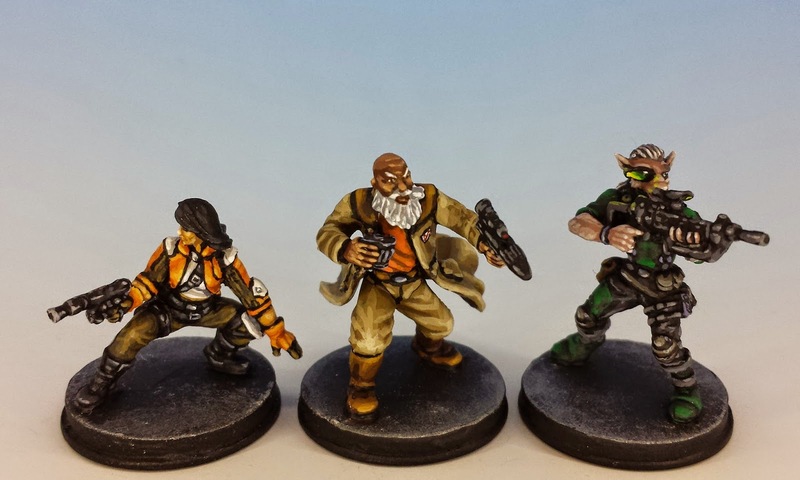 Great job on those miniatures sir, and a good read. The lightsaber shenanigans in the prequels are a real shame, less is definitely more. In the originals, there was emotional weight behind every duel. The Anakin versus Obi Wan fight from ROTS is just atrocious. I was so involved in your writeup that I hardly looked at your figures in the first pass through. A fine read. The figures are also top notch. I appreciate you writing that... As I was working on the post, I was a little troubled by the fact that the text and the miniatures aren't very closely connected. So somehow it makes me feel better to know that you enjoyed the writeup on its own! Great philosophy with great painting what's not to like. Well done sir. 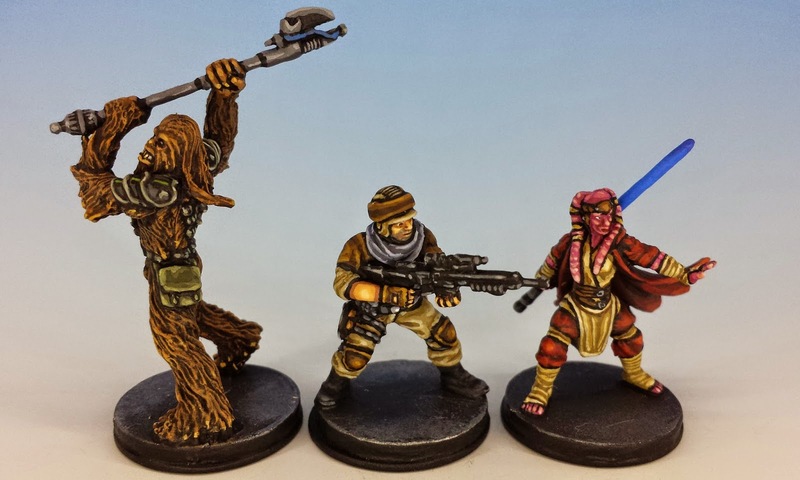 Besides, lovely work on the minis, I really like your painting style on these. I so agree with this. Also, Jedi duels used to be closer in style to medieval fighting (they are Jedi *knighs* after all) than Ninja/Matrix style fighting of the prequels, which didn't fit with Star Wars at all. I am a super Star Wars geek. But I'm also a geek with a lot of cognitive dissonance, since I basically pretend that nothing portrayed in Episodes 1-3 actually happened. It's like self-induced amnesia. I much prefer the Star Wars universe as it plays out in my own head to anything that came out post-Return of the Jedi. The voice of a true Oldhammerer! I really enjoyed reading this article, Matthew - you have me fully persuaded! Thanks for reading! Let's hope the upcoming movies understand the original trilogy a little better and bring more (as Bruno said) "emotional weight" to these duels. I can attest to the level of excellence achieved with these paint jobs, in person they are absolutely breath taking. It was a good read as well, can't wait for the next instalment of films with a cameo from buss light year! Hey Matthew, interesting post and nice figs. Although it is worth considering the power and influence of childhood viewing. Most of us saw the original movies as children and they simply blew our minds so any later reworking/return to the series will of course be met with disappointment. This was definitely my experience as well. But then along comes one's own children and one's own need to share one's passions and obsessions, which in turn leads to the watching of all the Star Wars movies. Suddenly the newer movies, when seen and shared through young, fresh eyes with no reference points and precedents to interfere with the whole viewing experience, becomes as mind-blowing and as powerful as the original. Dare I say, perhaps even more so in some cases. Especially, (he says knowing full well this will lead to excommunication, banishment and a general hunting down) the light sabre battles! Even as a child I thought the light sabre skills displayed by Darth Vader seemed lacking. (Which no amount of "emotional weight" could redeem. Or perhaps that's what weakened it - a good swordsperson must never let the emotions get in the way of the fight!) Anyway, just my excited two cents and thanks for getting me happily fired up! (This is better than coffee!) And also Ben's "look" harkens back to Lucas' love of John Ford and Kurosawa. Those are some great points. I don't have any kids myself, but I've spoken to a couple parents who say that their children love episodes 1-3, much more than the original trilogy. If I were a decent human being, I would think to myself "to each his own" or "every generation makes its own myths." But I'm not decent, so all I can do is cluck my tongue and think to myself, "Your children are philistines." As far as Darth Vader's skills go... It's certainly true that he's not particularly light on his feet. But for me, that is part of his power and menace -- he's strong not agile (the Star Wars script describes him as almost 7 feet tall). Fantastic! I smile in recognition! We must get a game in sometime, Matthew! I would love to get together for a game! Hey, that would be great! I sometimes make it over to Toronto, although they are usually quick in and out affairs. Have you seen the internet games that Mouse and I have played? Perhaps something like that sometime? Or who knows, together with 24 Cigs_ and others, we might put together a small Canadian Retro-gaming Event in the future? An internet game would be fun. And it would be just grand to get together with 24_Cigs (and others??)... now that I am finally playing proper Oldhammer battles (with him), the next step is to play some games with a GM. Anyway - are you on the Oldhammer Forum? If so, I'll send you a private message and we can exchange info. Interesting points. I read somewhere, I don't recall now where, an analysis of Yoda and Ben's behavior taking into account the prequels and things like 'the prophesy'. The gist of it was that Ben and Yoda knew they couldn't defeat Vader, so they were molding Luke into a Jedi assassin. It's why they lied about Luke's relationship, they didn't need his emotions clouding what he 'had to do'. Unknowingly, they were as blind as the Sith, in their own way, and were teaching Luke the old methods (which eventually led to the Jedi's destruction). Yoda didn't want Luke to face Vader because he knew the gig would be up if he did. Ben allowed Vader to strike him down to help forge Luke into a weapon. Luke, instead, was the one who brought balance to the force because while he accepted their teachings but cast off the parts of the Jedi code that led to their blinkered world view. Luke looked deeper into the one they though irredeemable and managed to save him, where they would have had him simply kill both Vader and the Emperor. It's an interesting theory, to be sure, and at least it ties up the prophesy nonsense, which was never explained or brought to resolution in the prequels. 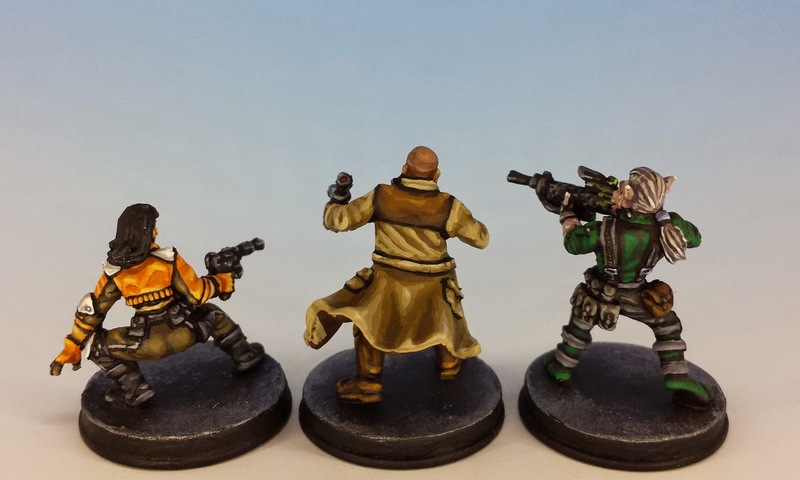 I know this is a zombie post, but adding anyways because I enjoyed both the minis and the write up immensely. 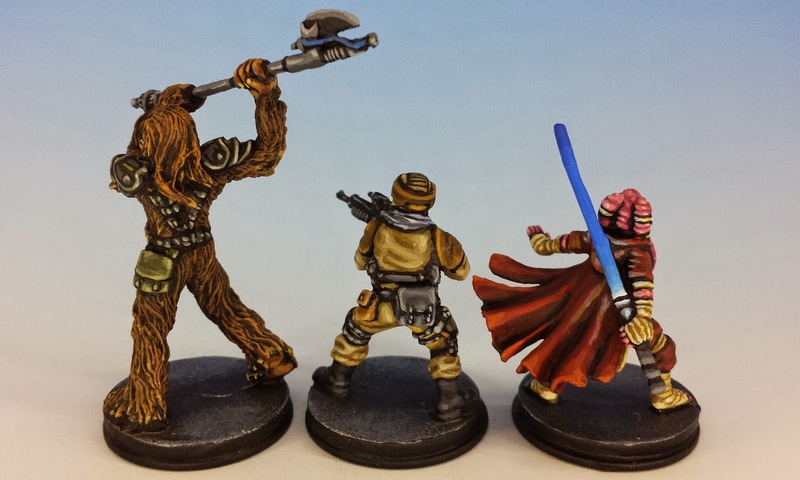 The moment that FFG chose for Luke's sculpts is one of my favorite parts of Imperial Assault. It captures one of Luke's transformations beautifully. He holds the blaster out as if afraid of its power. To this point, he has killed far fewer people than any of his compatriots. He remains a farm boy who has only just begun to learn of the force and even the galaxy at large. At this same moment, something has snapped inside young Skywalker. He has just witnessed the execution of his friend and guardian angel. For the first critical time, as you said, he let's go. Blaster bolts pour from the gun with unbelievable accuracy, killing half a squad of the Empire's Stormtroopers in seconds. Without a thought he is able to dodge the trooper's return fire and even hit a tiny control panel on the opposite side of the hangar. Luke has given into the Force. The mini captures that moment so well, making it my favorite in the box. I really can't tell you how much pleasure a comment like this gives me - it's a beautiful analysis of that mini. Please leave a zombie comment any time!